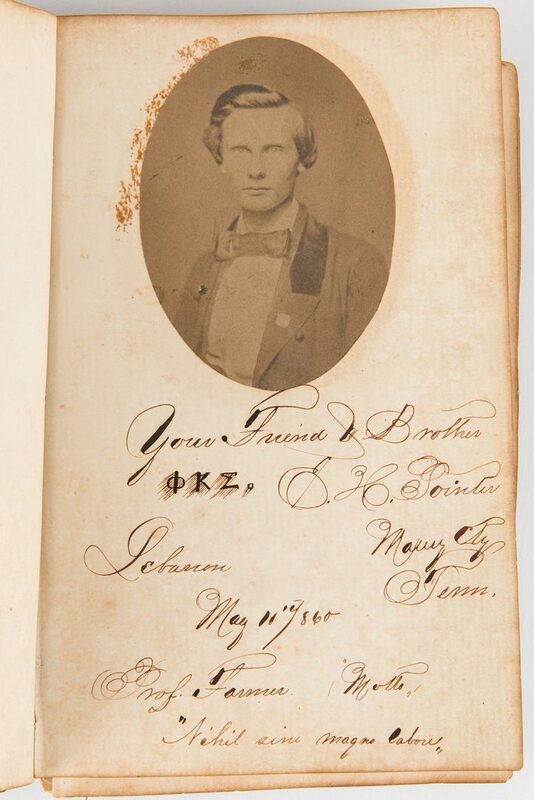 Civil War Era Tennessee fraternal album, comprised of autographs and photographs of members of Phi Kappa Sigma at Cumberland University, circa 1860. The fraternity was founded at the University of Pennsylvania in 1850 by Samuel Brown Wylie Mitchell. 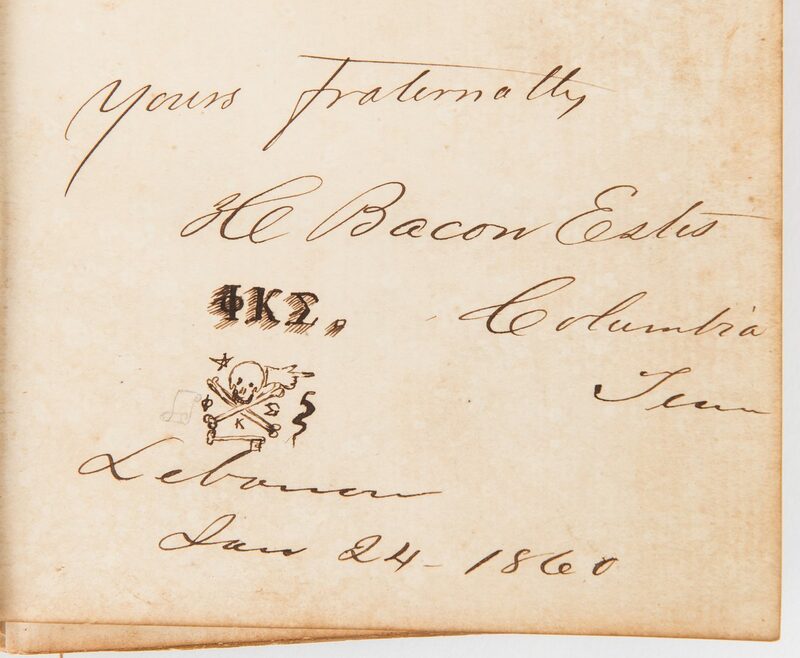 Cumberland University, located about 30 miles east of Nashville, became the thirteenth university on the roll of chapters in 1859. 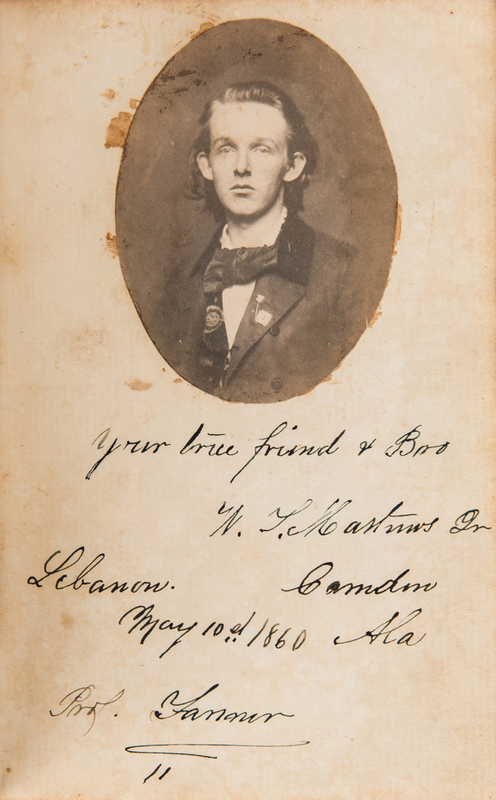 This album, compiled at the cusp of the Civil War, records the likenesses and signatures of mostly young men who would go on to fight on both sides of the conflict, many included in "The Boys Who Went to War from Cumberland University 1861-1865" by William C. Floyd and Paul Gibson, 2001. Includes thirteen (13) photographs and/or signatures of students who would fight as Confederate soldiers: Joseph H. Dew of Columbia, TN, enlisted as a private, 19th (Biffle's) Tennessee Cavalry, Company G, the only notation on his military records is that he was absent without leave in March 1865, (p. 138); David Short Goodloe of Canton, MS, enlisted as a private, 18th Mississippi Infantry, Company C, on May 28, 1861, promoted to adjutant on May 25, 1862, wounded and captured on the second day of fighting at Gettysburg, (p. 100-101); Lee M. Ramsaur of Early Grove, MS; enlisted as a captain, 1st Arkansas Mounted Rifles, Company D, on June 2, 1861, rose to rank of colonel on the regimental staff, wounded and captured at the Battle of Murfreesboro, (p. 162); A.B. 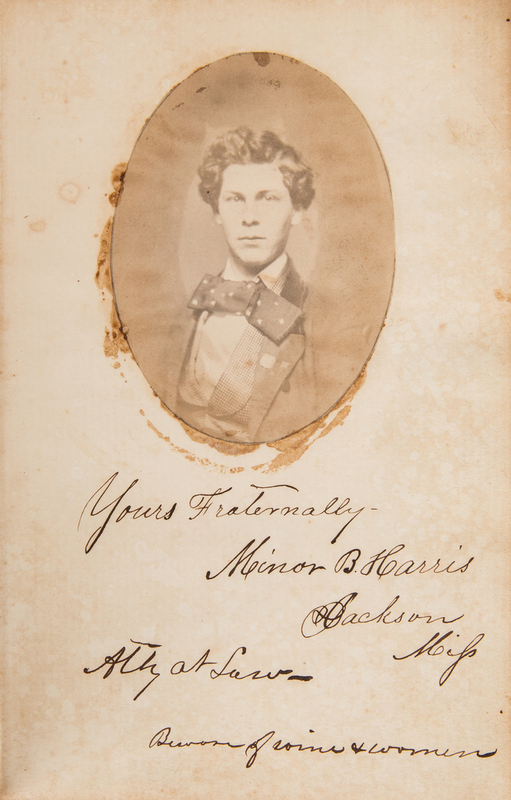 Washington of Memphis, TN, served as a sergeant in Captain Johnston's Tennessee Company of Artillery (Southern Guards Light Artillery), from April 21, 1861 to April 21, 1862 until he was mustered out, enlisted in the 154 Senior Tennessee Infantry, 2nd Company B, on May 10, 1862, elected 2nd lieutenant on April 20, 1863, severely wounded during the Battle of Chickamauga and died on November 26, 1863, (p. 87); Thomas J. Williams of Lebanon, TN, present at the initial organization of the 4th (Roddey's) Alabama Cavalry in October 1862, rose to rank of lieutenant, wounded near Florence, Alabama on May 7, 1864 (p. 175); James H. McClain of Lebanon, TN, enlisted as a private, 7th Tennessee Infantry, Company H, appointed 5th Sergeant on August 31, 1861, wounded at the Battle of Chancellorsville, had his leg amputated on May 4, 1863, died of fever on July 22, 1864 in Alabama, (p. 38-39); Stephen Newton McCraw of Selma, AL (no photo), enlisted as a 2nd lieutenant, 4th Alabama Infantry, Company C, on April 26, 1861, resigned on April 21, 1862, joined 51st Alabama Partisan Rangers as a private, wounded at Shelbyville, TN and captured on June 27, 1863, exchanged and promoted to 1st lieutenant as the acting adjutant to the staff Brigadier General William Andrew Quarles on December 3, 1864, listed on a Prisoners of War, and Stragglers, in Selma, Alabama on May 25, 1865 and paroled on the date, (p. 90); William J. Somervell of Brownsville, TN, served as a Captain of 2nd Arkansas Calvary, Company E, and was promoted to Major by General Fagan on July 20, 1864, reassigned to the Trans-Mississippi Department, 2nd Arkansas Calvary, he and his company were captured at Mine Creek on October 25, 1864 (p. 157); Alexander Allison of Lebanon, TN, enlisted in the 7th Tennessee Infantry May 1861, transferred to Captain McClung's Company, Tennessee Light Artillery, on August 1, 1861, elected 1st lieutenant on October 1, 1861, witness at a court martial in April 1863, "in arrest" at the same court martial May and June 1863, McClung's Company became part of 1st Tennessee Light Artillery, Company around May 1, 1864, captured near Morristown, TN on October 28, 1864 and sent to a military prison in Louisville, KY, transferred to Johnson's Island on November 22, 1864, released on June 16, 1865 after taking the Oath of Allegiance, (p. 178); Zachariah Frank Thompson of the Cherokee Nation (no photo), enlisted as a private, 7th Tennessee Infantry, Company H, transferred to Company K on September 1, 1861, discharged effective August 24, 1864 because he was a minor, volunteered with the Lebanon Greys at sixteen, enlisted in the 8th (Smith) Tennessee Calvary and remained until the close of the war, (p. 41); Issac A. Patton of Goliad, TX, enlisted as a 2nd lieutenant, 3rd Battalion (Yager's) Texas Calvary, Company B, October 11, 1861, unit consolidated with Taylor's and Ware's Battalion in May 1863 to form the 1st Texas Calvary (Yager's), last entry in his military record shows him present for duty in February 1864, (p. 168); and James M. Witherspoon of Nashville, TN (no photo), enlisted in 15th Tennessee Calvary, Company H, on November 18, 1863 and elected 1st lieutenant the same day, unit broken up and assigned to Stewart's and Longwood's Regiment, also called the 15th Tennessee Calvary in February 1864, his name last appears on muster rolls on May 23, 1864, (p. 169). 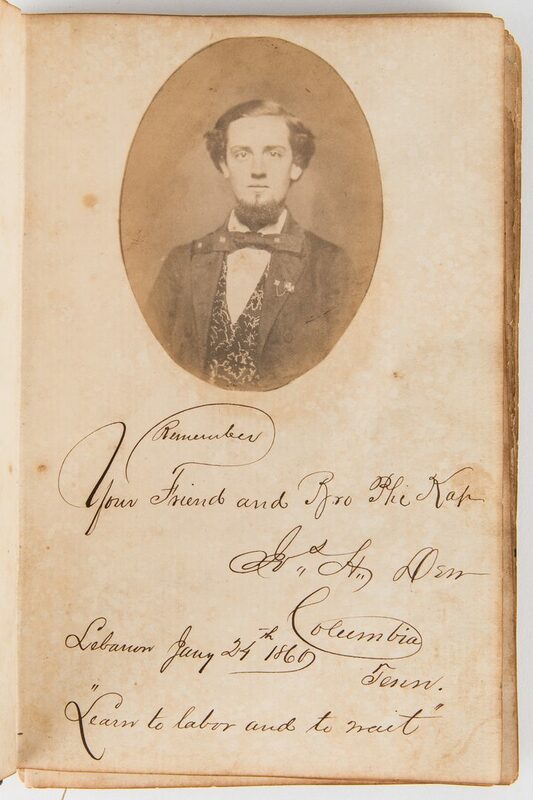 Also includes one (1) photograph and signature of William Y. Pemberton of Versailles, MO, private in (Union) Osage County Regiment, Missouri Home Guard, Captain Bradshaw's Company G, later joined the 47th Enlisted Missouri Militia and elected 1st lieutenant, pension records state he lost the sight in his left eye during the war, (p. 191). Three (3) faculty members are also included: Abraham B. Caruthers, Professor of Law, Representative of Wilson County in the TN Secession Legislature of 1861, (p. 21); Nathan Green, Sr., Professor of Law, State Senate of TN in 1826, Judge of the State Senate Supreme Court in 1831, (p. 22-23); and Nathan Green, Jr., Professor of Law, Staff Officer under General A. P. Stewart, Superintendent of Engineering Works in Macon, GA, Fourth Head of Cumberland University in 1873, Chancellor until 1902, appointed dean of the School of Law in 1882 until his death in 1919, (p. 24-25). 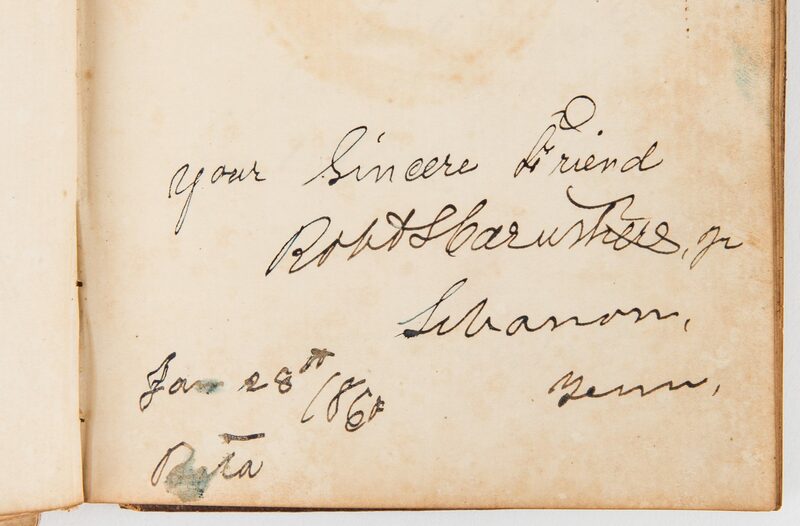 Other photographs and/or signatures not listed in "The Boys Who Went to War" include: John C. Carter, Lebanon, TN, Minor B. Harris, Jackson, MS, T.J. Mann of Brownsville, TN, Bacon Estes of Columbia, TN, J.W. 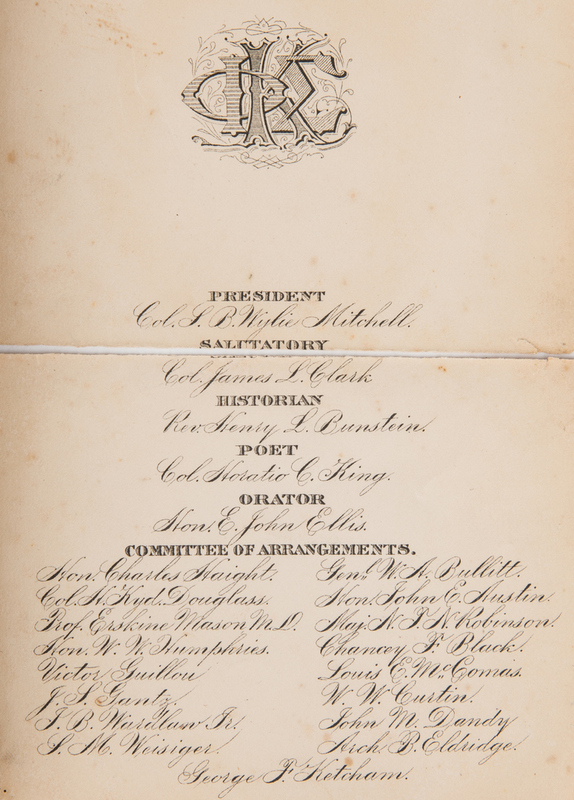 Randles of Aberdeen, MS, E.H. Pointer of Maury Co., TN, Dan T. Saffarraus of Memphis, Cicero Spurlock of McMinnville, TN, C.S.O. Rice of Durhamville, TN, Jo. 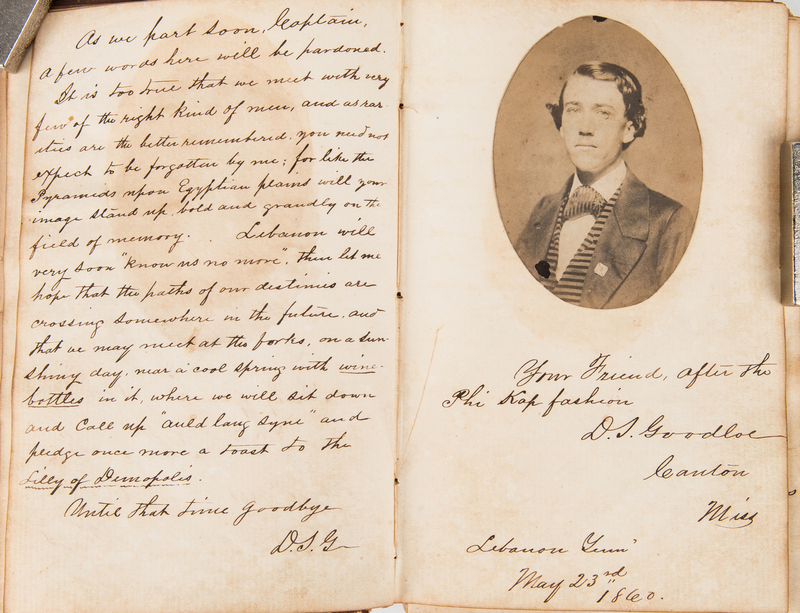 H. Caruthers of Jackson, TN, Robert Caruthers Lebanon, TN (no photo), Presley N. Connor of Ripley, TN, J.L. Griggs of Mason, MS, Bob E. Houston of Madisonville, TN, T. or S. Sevier of Canton, MS, R.O. 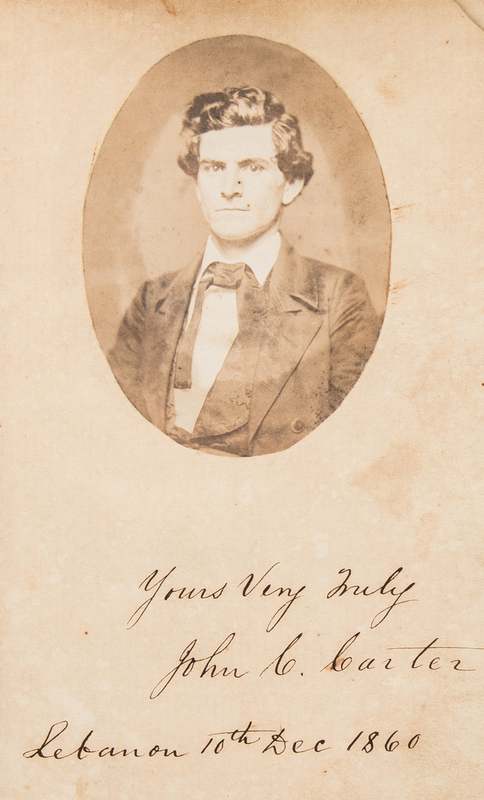 Booth of Vicksburg, MS, G.A. 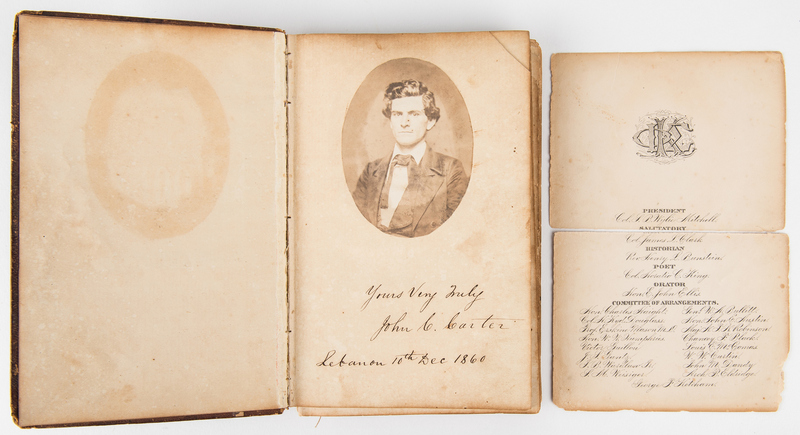 Pillow Jr. of Columbia, TN, Thomas D. Dodd of Glasgow, KY, and Powhatan R. Baptist of Dayton, AL. 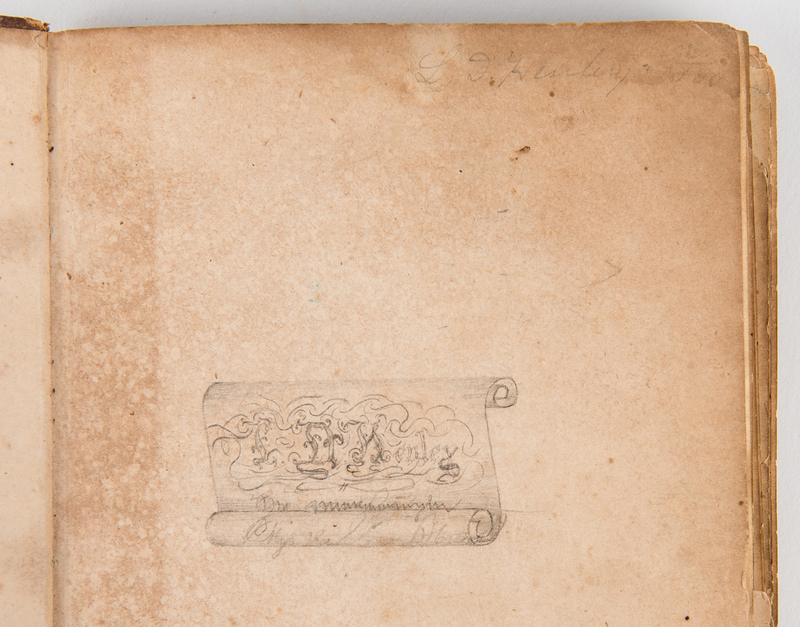 Pencil inscription verso with owner's name, "L. D. Henley" (some inscriptions mention "Lew"). Approximately 75 signatures total, 45 accompanied by photographs. 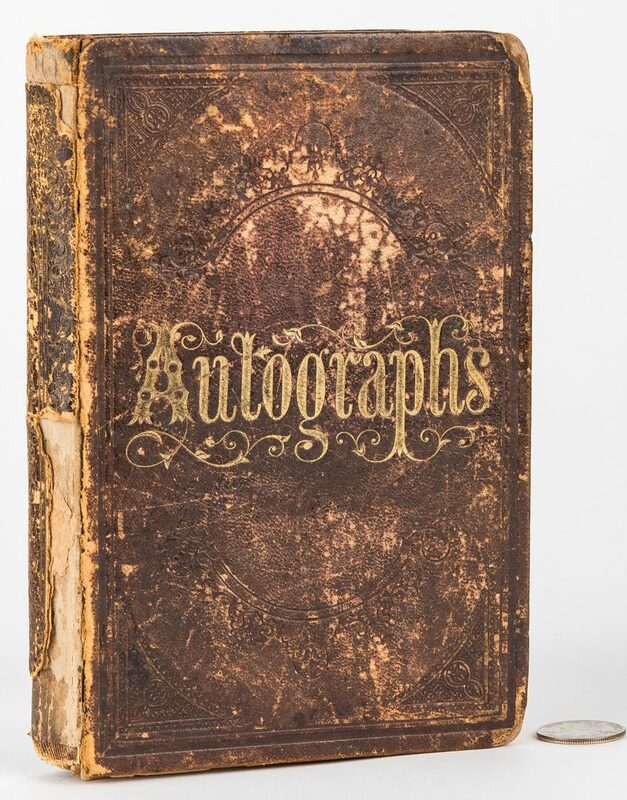 Hardbound in a tooled leather cover, approximately 72 gilt edged pages. 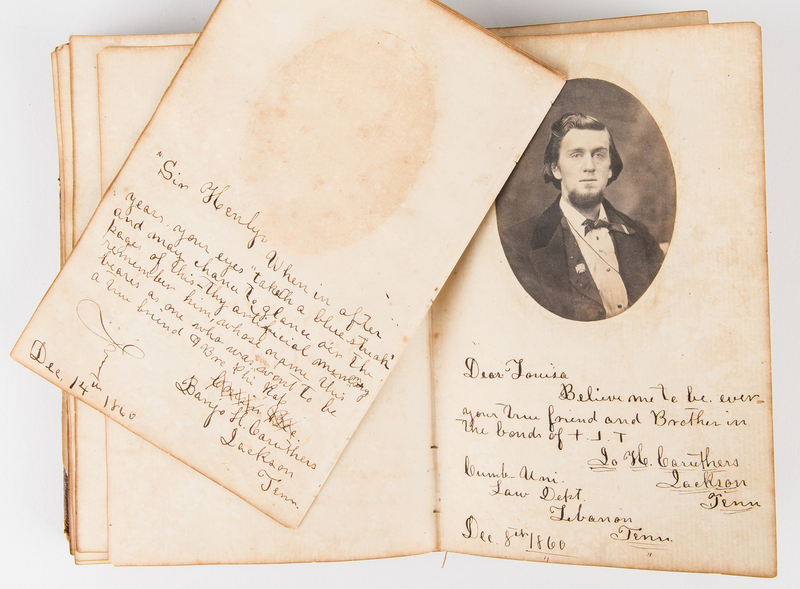 7 1/2" H x 5" W x 1 1/4" D. Note: The owner might be Lewis D. Henely, alternate name L. D. Henley, who was a private then promoted to sergeant in the 5th Regiment Alabama Infantry, Company H. (source: National Park Service Film Number M374 Roll 20). CONDITION: Part of spine missing. Printed list of national leaders is detached, with full horizontal tear. Several other pages have come detached from binding. General toning and foxing.